A special ticketed R. John Wright dinner event at this year's R. John Wright Convention, provided the atmospheric setting for the introduction of the eagerly-awaited Winged Monkey - the newest addition to our Wizard of Oz Series. 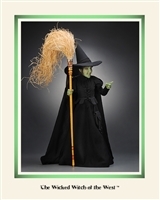 The fearsome Winged Monkey measures 8 1/2 inches tall and is in perfect scale to the other RJW Oz characters - including the Wicked Witch the West as shown in the photo. Made of the finest custom-made wool coating in a lavender/grey shade, the Winged Monkey is five-way jointed for expressive posing. He has a molded felt face with inset glass eyes and hand-painted features. His hands and feet have separately-sewn fingers and toes and his hair is styled of the finest mohair. The Winged Monkey is costumed in the distinctive felt jacket and cap with a layered applique design in the colors of the Wicked Witch's guards. Last but not least, his awesome wings are fashioned out of felt and mohair plush with a wire foundation and artistic airbrush coloration. No detail has been spared to bring this frightful character vividly to life! Produced in an edition of only 150 pieces worldwide, the Winged Monkey comes beautifully boxed with a numbered tag and corresponding certificate of authenticity. 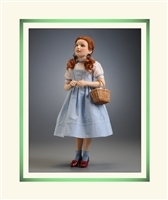 We are pleased to present "Dorothy"™ - the centerpiece of our exciting series based on the classic MGM motion picture The Wizard of Oz™ The Kansas farmgirl swept over the rainbow into the Land of Oz was unforgettably portrayed by Judy Garland in the 1939 film. Now, this beloved film character has been vividly brought to life for the first time in the medium of molded felt. Standing 16" tall, Dorothy is fully jointed at shoulders, hips and neck with the R. John Wright ball & socket jointing system with internal wood mechanism. She has a realistic molded felt torso and limbs and her lovely hands have individual fingers. The compelling portrait face is finely modeled in a true likeness with delicate hand painted features. Dorothy's meticulously hand-knotted wig is made of the finest custom-dyed mohair and precisely styled. Oz's beloved heroine is outfitted in the trademark costume consisting of a blouse of fine Italian cotton organdy with custom-dyed rickrack trim, period undergarments, and a pinafore dress tailored of imported blue checked cotton fabric. The dress is exactly patterned after the original design by famed MGM costumer, Adrian, with authentic A-line styling and includes such details as the hidden pocket in the side seam! On her feet, Dorothy wears cotton anklets and detailed miniature replicas of the iconic Ruby Slippers - hand cobbled out of fine leather and covered in micro sequins, rhinestones, and faceted crystals. On one arm, Dorothy carries a custom made miniature of the basket in the film with checkered napkin inside. No effort has been spared to make this the most authentic version of this beloved character ever created. Dorothy is produced in a very limited edition of just 350 pieces worldwide . Each doll will come enclosed in a deluxe presentation box with the accompanying signed and numbered certificate of authenticity and the forms for owner registration. Matching numbers will be provided to other characters in the Wizard of Oz™ series subject to availability. We are pleased to present the "Wicked Witch of the West™" - the newest addition to our exciting series based on the classic 1939 motion picture masterpiece The Wizard of Oz™. Faithfully designed on the character immortalized by Margaret Hamilton in the 1939 film, Oz's fearsome villain has been brought to life by R. JOHN WRIGHT DOLLS for the first time in the medium of molded felt. Standing 17" tall, the Wicked Witch is fully jointed at shoulders, hips and neck with the R. John Wright ball & socket jointing system. She has a realistic molded felt torso and limbs and her amazing felt hands have individually sewn fingers with applied fingernails! The molded felt character face has been finely modeled in a true likeness with hand painted features and shaded green complexion. The Wicked Witch's wig is made of the finest custom-dyed mohair and styled exactly as it was in the film. Extensively researched for the utmost in authenticity, the Wicked Witch of the West is outfitted in a tailored Victorian-style dress of black cotton fabric with a matching laced waistcoat and purse. A dramatic flowing black cape fastens at her throat. Period undergarments, dark stockings, hand-cobbled black pumps and a replica hat with attached silk veil complete her trademark ensemble. This is the most accurate representation of this iconic film character ever created. In one hand, the Wicked Witch carries a detailed custom-made miniature of the broom as seen in the film. The Wicked Witch of the West will be produced in an extremely small edition of just 250 pieces worldwide. Each will come enclosed in a deluxe presentation box with the accompanying signed and numbered certificate of authenticity and the forms for owner registration. Subject to availability, matching edition numbers will be provided to other characters in the R. John Wright Wizard of Oz™ collection. Faithfully based on the beloved character immortalized by Jack Haley in the 1939 film, the Tin Man has been brought to life by for the first time in the medium of molded felt. The R. John Wright Tin Man is the most faithful recreation of this character ever produced. Standing 18 inches tall, he is an all-felt doll fully jointed at the neck, shoulders, elbows, hips and knees with the RJW ball & socket jointing system with an internal wood mechanism. Beneath his costume, the Tin Man has a realistic molded felt torso and limbs. Under his gloves, his amazing sculptural felt hands have individually sewn fingers! The character face has been finely sculpted in a true likeness and skillfully molded out of felt with hand painted features and a hand-applied metallic complexion. Extensively researched for the utmost authenticity, the Tin Man's iconic costume has been precisely recreated in one-quarter scale. The suit is made just as the original was using several layers of buckram, a stiff fabric coated with glue. The buckram parts are bonded to silver paper and joined together with metal rivets to allow movement. The costume is accessorized with detailed gloves, a funnel hat (also crafted out of buckram), and a wooden replica of the original Tin Man's axe. No detail been spared to bring this beloved film character vividly to life as never before. 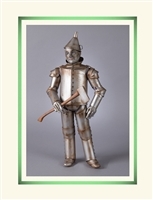 The Tin Man will be produced at the R. John Wright Dolls studio workshop in Bennington, Vermont, in a numbered limited edition of only 250 pieces worldwide. The 'RJW' brass button will be affixed to each doll as a lasting mark of identification and a signed and numbered certificate of authenticity will be included inside the deluxe Wizard of Oz presentation box. Subject to availability, matching edition numbers will be provided to other characters in the fully-licensed Wizard of Oz™ collection. Faithfully based on the beloved character immortalized by Bert Lahr in the 1939 film, the Cowardly Lion has been brought to life for the first time in the medium of molded felt. 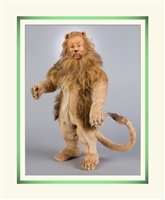 Standing 17 inches tall, the RJW Cowardly Lion is the most faithful recreation of this character ever made. Beneath his costume, he is an all-felt doll fully jointed at the neck, shoulders, elbows, hips, knees and ankles with the RJW ball & socket jointing system with an internal wood mechanism. He has a realistic molded felt torso and limbs and sculptural felt hands with individually sewn fingers. The character head has been finely sculpted in a true likeness and skillfully molded out of felt with hand painted features and inset whiskers. The Cowardly Lion's iconic costume has been precisely recreated in one-quarter scale. The suit is fashioned of fine custom-made mohair plush in varying colors and lengths. The paws and feet of his costume include sculptural paw pads and inset resin claws. His wig is fashioned of the finest mohair combined with meticulously hand-knotted human hair. Extensively researched for the utmost authenticity, no detail been spared to bring this beloved film character vividly to life as never before. The Cowardly Lion will be produced at the R. John Wright studio workshop in Bennington, Vermont, in a numbered limited edition of only 250 pieces worldwide. The 'RJW' brass button will be affixed to each as a lasting mark of identification and a signed and numbered certificate of authenticity will be included inside the deluxe Wizard of Oz presentation box. Subject to availability, matching edition numbers will be provided to other characters in the fully-licensed Wizard of Oz™ collection.